Beth Revis is back on the show, y'all! She joined us via Skype to discuss the stunning final volume in her Across the Universe series. We were utterly thrilled to chat with Beth again, and we know you're going to love this interview. Also in this episode, Michelle goes on maternity leave and Allison shares her book pick of the month, The Star of Kazan, by Eva Ibbotson. Stop by Beth's website to keep up with her latest news, and visit her publisher, Razorbill (an imprint of Penguin). Edit: Oh my gosh! We almost forgot to mention the awesome giveaway that Beth is doing for our listeners. You could win a set of signed Across the Universe books. Just comment and tell us... if you had a spaceship, what would YOU name it? Be sure to include your Twitter handle or a way for us to contact you. We'll post the winner on the blog next week on March 5th with our Shannon Messenger launch party podcast! US Residents only please. Podcast hosting courtesy of archive.org. Intro music by 46bliss. Special thanks to our sound engineer, Marc Conrad Tabula, for his awesome audio editing skills. Please subscribe to Authors are ROCKSTARS! on iTunes so you'll never miss an episode. Thank you for listening! I can't believe this series is over! Beth, you are on my auto-buy list. Just saying. If I had my own spaceship? I would probably name it "Petrichor". Petrichor means the smell of rain, which is to some, comforting and soothing. I definitely find a light rain comforting. So, my spaceship would be named for something comforting and peaceful, which I would hope would bode well for my journeys across the stars. Thank you all for this awesome giveaway! I absolutely LOVE the Across the Universe series, and it was great hearing Beth! I enjoyed listening to this podcast interview, and as for what I would name my spaceship if I was ever lucky to receive one, probably something ordinary like Darkstorm-7. What a fantastic interview! 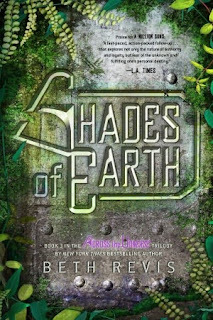 I am SO excited about Beth Revis' 'Across the Universe' books and would love to have the chance of reading and discovering her work. As a fan of the Young Adult genre and all things fantasy/sci-fi/paranormal, her work does sound interesting! In response to your question i would have to call my spaceship "Starship Cobalt" (as a bit of a star wars & trek fanatic, this springs to mind). Please tell me this giveaway is international, please!! Loved the podcast interview, Beth Revis is soo cool. Awesome giveaway! I would name my spaceship "Nephilim 1524", Nephilim for shadowhunters ;) and 1524 because it is a combo of my b-day and my sister's b-day. I would probably name my ship The Semicolon. Hear me out: whenever a reader sees a semicolon, they know that the best is yet to come, and that there is an infinite possibility of outcomes to follow that semicolon. That's what the idea of outer space and space travel is to me, and I want to constantly be on the verge of something new. Thanks for the excellent giveaway opportunity! Very fun!